Oprah recently featured the Get Clean line on her “favorites” show…and because of that, Shaklee is offering the “Get Clean Starter Kit” at a huge discount (33%) until Friday, November 30. AND…by ordering the kit (or anything 50pv or higher) you will also receive a lifetime Shaklee membership, giving you a 15% discount on all future purchases (also a special that ends on Nov. 30). *Fresh Laundry Concentrate: It smells so great and works MUCH better than other natural detergents I’ve tried. *Nature Bright Laundry Booster: Gets out stains and stinky stuff…great for soaking, carpets, and more! *Hand Wash Concentrate: I cut onions and garlic a lot and this works really, really good at getting the stink out! *Basic H Organic Wipes: Oh Basic H wipes…how do I love thee? Let me count the ways These are AWESOME. For those of you who still aren’t at 100% cloth in your homes…check out these all purpose wipes that are safe to use everywhere. *Scour Off Heavy Duty Paste: I’ve never smelled a scouring powder so delicious. These are just a few of my faves…but you really have to try them to believe it. Everything has a 100% guarantee…so check it out! And of course…by purchasing Shaklee items, you’re supporting the Live Lightly Tour as well. This special offer ends on Friday (today!! )…so you have until midnight to take advantage of it. Click here to order the Get Clean Special Edition Starter Kit…and don’t forget to tell your friends!! Our goal is to turn 10 households green TODAY…will you help? I “met” Cindy many years ago on the Mothering….I was fascinated by her boat-dwelling life and had corresponded with her several times. When we were planning the tour, I knew we had to hook up with her family in Annapolis! Cindy has lived “on the water” for the last 10 years…most recently in a 44 foot catamaran with her husband, Doug, and her 3 year old son, Zach. AND of course, we can’t forget their dog…affectionately referred to as “Schooner-dog”. We had so much fun hanging out with another family who understands what it means to truly live small. I was really surprised at how much space they do have in the boat. The exterior is very deceiving…but there are so many great nooks and crannies down below. The kids had the most fun exploring it all. They were like little monkeys…climbing and hanging on everything they could get their hands on. 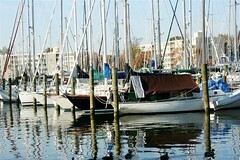 We parked the RV in the marina parking area and on Sunday morning, awoke to the sun glistening off the water…and beautiful boats all lined up in the harbor. This is probably one of my favorite things about RV life…having a different view everyday. The night before, we had attended a wedding “party” of their friends across the dock. 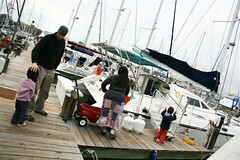 We enjoyed meeting their friends and seeing another beautiful catamaran. Cindy and Doug have traveled the world (and have plans to go again! )…and have the stories to prove it. You can read about one of their adventures in the book , The World is a Kitchen…in which she was a contributor. This family was a delight to visit and we enjoyed their company so much. Weeeeeee! We’ve been going fast fast fast since we started this journey…and I’ve started to get “behind” in my blogging, as many of you have noticed I ask that you will be patient with me…I have soooooo many photos to edit and it takes up a huge chunk of my time. When time is pretty much a luxury, blogging gets put on the back burner. I am catching up though…so you can expect to see more entries over the next couple of weeks. If you really need to read something in the meantime, jump over to my other blog for a bit. The archives should keep you busy for awhile. During the first month of the tour, we were still transitioning into our new life as “vagabonds”. Now that we have about 4,000 miles under our belt, we feel like we’ve hit a comfortable stride. We have routines and ways of doing things. Most of the things you learn on a trip like this come out of trial and error. We are constantly revising and editing our methods. For example, it’s good to have ONE person with the job of adding the enzymes to the black tank (why don’t they just call it what it is…it’s a POOP tank…poop tank is more fun to say anyway) after dumping. We’ve had several occasions where we have both added one because we thought there wasn’t one in there. It’s an interesting thing to carry your bodily waste around with you in your car/house. Another example…we’ve learned over and over that you always open cupboards and doors very slowly after the RV has been moving/driving. I can’t even tell you how many times I’ve had a waterfall of books fall on me…or every single personal bathroom item from the cupboard dump onto the counter. It makes me crazy…and yet I forget much of the time! But I’m learning… We are getting better at knowing how to keep life sane (i.e. keeping the RV clean ALL the time!). I am so, so happy to be blessed with a husband who helps me with “domestic duties”. In this past month, he has made the bed everyday, does the laundry, keeps the trash empty…and even has a hot cup of perfectly brewed coffee waiting for me when I wake up. On top of this, he excels in his role as a father…loving and teaching Bella with a heart full of grace. I love this man!! Bella has continued to have an enormous amount of playtime with other 3-5 year olds. She has had so much fun and loves meeting new people. It’s been great to watch her change and grow as she experiences more and more of the world around her. She is speaking so clearly now…it’s fun to listen to her talk on the phone and have lengthy conversations with other people. Whenever she is referring to friends we have met on the tour, she points towards the back of the RV and calls them “our friends back there”…as in, friends we have had to leave behind…friends who we waved at as we drove away. It’s so cute She had a great time bonding with my family in NYC and DC…and is looking forward to seeing her other Grandpa and Grandma at Christmastime. Much of the time, she insists on being called Erica. Or Annaliese. Or Dorothy. Or any other name of a princess that she has decided on for the day. Her imagination is in full swing right now…and she and the little girls on the tour route have oodles of fun dressing up and pretending to be royalty. Miraculously, we have managed to stay relatively healthy so far. We’ve somehow outrun strep throat, colds, and the flu. We’ve had bouts of sore throats from talking so much and from dry weather…and Bella currently has a runny nose and cough. But it’s nothing that a little homeopathy and herbal remedies can’t cure. We take our vitamins religiously and Bella is taking an echinacea/astralagus blend to strengthen her immune system. I love to drink echinacea tea as well…the Yogi brand is particularly yummy (you have to love a company who makes the INSIDE of the box pretty too). I strongly believe that food is medicine…and eating on the road is definitely taking it’s toll on us. It’s not that we’re eating badly all the time…but generally, when you take a road trip, you give yourself “permission” to partake in food you wouldn’t normally eat (because you’ll go back home and make up for it by eating healthy). The only problem is that we do that everyday! So we are working on eating REALLY nutritiously while we are in the camper…and then enjoying the indulgence when we are eating out or with someone else. Everyone has blessed us with cookies…or bars…or other sugary goodness. We love it. Oh so tasty…but it makes learning the art of discipline and moderation harder I’ll be consulting Jessie about some good detox remedies to try while we’re back. Of course, avoiding sweets during the holidays will be a giant task! When you are in a different place nearly everyday…and any sort of “routine” is a dream instead of a reality. It seems much more difficult to engage in a daily time with God. This is definitely a problem, because in this whirlwind of a trip….where everything is changing all the time, being focused on Jesus and taking strength from His words and teachings is even more important. When my physical strength is sapped, I can still be strong in mind and spririt when I have been abiding in Him. We have been focusing on making a deliberate effort to get back into the groove of worshiping Him throughout the day…whether that be reading the Bible, praying, listening to a sermon on podcast, or taking in the beauty of His creation. It is my heart’s desire to start getting up earlier again (before sunrise!) to spend time in the Word…this discipline flew out the window when we hit the road. The late hours and weariness has taken it’s toll on me…and it’s so necessary for me to have that extra time right now! Speaking of going south…we are in South Carolina right now and will be “resting” here for a bit at a good friend’s home. We will fly back to Minneapolis on Dec. 12 and will spend time with both of our families throughout the holiday season. We have a one-way ticket…so our return date is up in the air. We will be working for my dad and Matt’s dad to make money to continue to tour while we are back in the Midwest. We’ll fly back to SC to pick up the RV and continue south when we have an adequate amount in our bank account. It may appear that we have “big corporate sponsors” but the cost of the tour has all been out of our own pocket…with occasional help from generous supporters. When I say out of our own pocket…I do mean out of God’s pocket…everything we have is truly His and given to us by Him. We have been amazed and delighted with how He has provided for us on this tour. When it seems that our resources have been depleted to nothing, He has provided in miraculous ways. Our product and service sponsors have been a great help as well…thank you to you all! While we are taking a break from the day to day travel…we will still be working at making contacts at colleges in the South. If you went to a college in Florida, Georigia, Texas…or any other Southern state (and you have contacts), let us know. We are also available to do demos at private schools and businesses as well. Our best stops have been a result of a personal contact from someone who reads the blog or someone we’ve met along the way. We have been so incredibly blessed by the families we’ve stayed with…and the new friends we’ve met. These are people that I know we will stay in touch with for a lifetime. They have opened their homes and their hearts to us and provided a resting place for three weary travelers. We are so thankful for all of you who faithfully follow our journey (those we have met in person and those who are online friends)…we’ve gained so much “family” since hitting the road. You have blessed us with your words, your hugs, your talents, your children, your food…may God bless you richly in return. We were especially excited to arrive in Washington, D.C…because my parents would be joining us! We arrived on Sunday night at got settled in at the Cherry Hill RV Park in College Park. It’s a lovely little place…with nice amenities. They had a full laundromat, sauna, hot tub, wi-fi, playgrounds, a café, grocery store, and a real wood fireplace in the lodge. We would be staying there the entire week with my parents. On Monday morning, we took the bus to the Metro station. The bus was filled with college students who had camped at the campground overnight in tents (and it was coooooold!). They were armed with protest signs and bright eyes…and had come from colleges all over the nation. They were all heading to the capital to take part in Step It Up 2007…a rally focused on creating global warming awareness. It was fun to chat with them and hear the passion and excitement in their voices as they got ready to make a difference…each in their own way. We arrived at the Metro station and headed inside. We felt like pretty experienced train riders at this point…so finding our way to Ronald Reagan Washington National Airport was a piece of cake. We arrived on time and located my parent’s gate. Bella picked a spot on the floor and settled in with the iPhone to watch a movie until they arrived. We craned our necks as we watched passenger after passenger walk down the hallway. I think they must have been the very last people off the plane…because FINALLY we saw them walking toward us with big smiles. Bella dropped what she was doing and sprinted towards them. Hugs, hugs, and more hugs….followed by kisses and more hugs. We promptly purchased some coffee and headed out for our adventure in Washington, D.C.! The Archives: We loved seeing the REAL Declaration of Independence and The Constitution. What a great experience. We’re big fans of National Treasure, so it was fun to remember that scene in the movie. Open Top Tour Bus: We took the bus around the city and it was so much fun to ride on top and see everything from 14 feet up! It was fun to see DC that way. It was a little chilly at times, but well worth it. Bella loved riding WAY up there…all cuddled up in the sling. The tour guides were often quite amusing as well :). 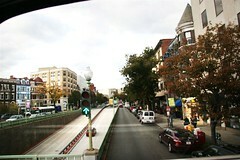 Dupont Circle: This was probably my favorite part of town. There was such diversity and cool little places to go. We ate at a sushi restaurant there on the first night in town…it was such a beautiful night and we enjoyed walking by all of the stately brownstones and apartments on our way. 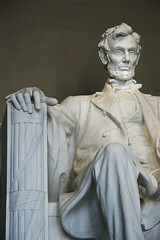 Lincoln Memorial: All of the memorials are moving and profound. But this one was breathtaking. Such a beautiful view…and Lincoln is…well…HUGE! There were a lot of events going on around all of the memorials because it was just a few days until Veterans Day. Busboys and Poets: This was by far my favorite restaurant in the city. The food was phenomenal, the prices low, and the atmosphere ripe with optimism. It’s a coffeehouse, bookstore, restaurant, and performing space all in one…and the focus is on social awareness and peace activism. Be sure to try the goat cheese salad if you go! Postal Museum: We LOVED this one. It is very kid-friendly and being that I have a slight obsession with sending and receiving “real” mail…it was highly entertaining and informative. It was right outside of Union Staion, which made it super easy to get to. 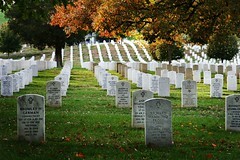 Arlington Cemetery: This was a sobering and memorable experience…one that everyone should take part in sometime in their life. Ft. Meade: This was where I attended the “Defense Information School in 1998-1999 for the Air National Guard. I was a photographer in the military for 6 years…and DINFOS is where all of the “artsy” people go to train (all 5 branches of service). I made so many wonderful friends there and had so many great times. It was so much fun to go back…and show my family where we marched, learned, and lived. On Saturday morning, we all got ready and headed out for one last cup of coffee before mom and dad flew back to Iowa. It was such a fantastic week…I feel so blessed that I can stay in a small RV with my parents and love them more when they left than when they arrived! It was indeed a sweet time of fellowship and fun. After Philly, we headed West past Lancaster to Marietta, PA. It was a short, but delightful visit. We were parked at the Susquehanna Waldorf School and we had the chance to meet so many interesting people. Hilary and her children Jahna and Simon stopped by…and brought us tomatoes from her garden, maple syrup, and homemade strawberry jam. Yum! 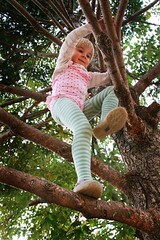 Bella had so much fun swinging and climbing trees with the kids. It was the first tree she climbed all by herself! They live just blocks away from the school and they own a cafe in town. Kristy from Hampton, VA was in the area for a retreat, and she stuck around to meet up with us! She and I were both photographers in the military and went to the same “military art school” at Ft. Meade, MD (at different times). We also met Scott, another “greaser” (he wrote an article about us here) and other parents from the school. Be sure to check out the photo album and see the cute little strawbale house that the Waldorf students made! Philadelphia, PA: Gimme Some Love! The City of Brotherly Love. The Cradle of Liberty. Philadelphia! After battling the traffic from New York City…we pulled into Barrington, New Jersey (just across the river from Philly). We got settled, met our fabulous hosts…Robert, Lauren and their 3 year old daughter Ella. 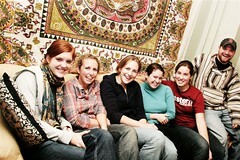 That evening, we headed out to have supper with an Eastern University student group called SPEAK. We had a great time hanging out and chatting about the projects that they have going on at their campus. They have worked hard to bring social issues to light…working to make sure only fair trade coffee is served at Eastern, and also promoting awareness about where the clothing in the campus bookstore comes from. They have partnered with Dotted Line Shirt Company to make and sell ethically made shirts with the Eastern logo on them. We were so encouraged by these students…you can see the passion in their eyes as they talk about how they have helped affect change on their campus. Keep it up SPEAK! The next day, we spent time exploring the heart of Philly. We headed down to the Independence National Historical Park and Washington Square. There is so much history there…such a rich past! We tried to visit Independence Hall (where the Declaration of Independence was signed in 1776), but they had already given out all of the free tickets for the day (we were so sad!). We were able to see the Liberty Bell and also the Independence Hall Visitor’s Center. It was pretty chilly that day, but we enjoyed walking around and seeing the sights. 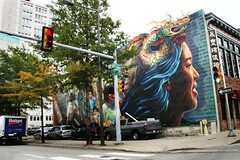 There are so many murals! It was a very busy Saturday…so when we tried to go and get Matt an “original” Philly cheese steak, we saw lines out into the street! And after trying unsuccessfully to park in that area, we decided to head back. Back in Jersey…we were treated to seriously gourmet meals by our hosts. Robert used to work in the restaurant business and is quite the chef. 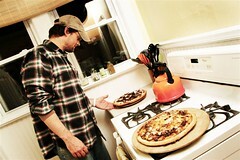 We had delicious homemade pizzas for supper and pumpkin pancakes for breakfast. Yum! Lauren kept the coffee strong and flowin’ freely We had a great time talking about life…where we’re at and where we’re going. Robert currently works for Tony Campolo’s organization, EAPE. Tony is an outspoken voice for social justice…his ministry focuses mainly on inner city work. 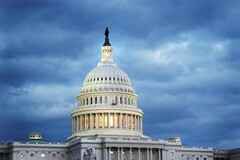 Tony is also part of a growing movement of “Red Letter Christians“…who “believe that Jesus is neither a Republican nor a Democrat, and want to unite Christians who are concerned about what is happening in America”. Robert also works closely with Shane Claiborne…whose book, “The Irresistible Revolution” played a key role in our desire to downsize our possessions several years ago (click here to download a preview chapter). Shane is part of the intentional community The Potter Street Community (previously known as The Simple Way). Be sure to watch for his new book, Jesus For President, coming out in summer 2008. Bella and Ella had tons of fun. They dressed up endlessly, jumped, played with the puppy, jumped some more, traded shoes, and painted their fingernails red (without informing the mommies). Of course, the goodbyes came too soon…and we were off to Lancaster! 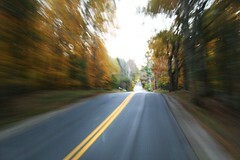 We in currently in Virginia…enjoying more beautiful fall colors and great hospitality! We made a stop yesterday at Lynchburg College and had several news outlets come to chat with us. One in particular, WDBJ7 in Roanoke did a great job…and we wanted to share it with you. Click here to go to the main page, and then click on the individual videos along the left side. More photos and entries coming soon…Philly, DC, Annapolis, Richmond, Lynchburg, Roanoke. Phew! I better get busy Thanks for your patience! We are excited to announce our newest sponsor…Alterra Coffee! 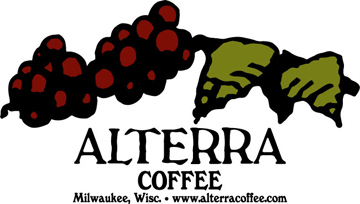 A Milwaukee-based roaster, wholesaler, and retailer of specialty coffees, Alterra has implemented a number of eco-friendly practices and policies, including (but not limited to) incorporating recycled materials in the building of its cafes, sourcing energy renewable sources, and promoting bicycle commuting among its employees. 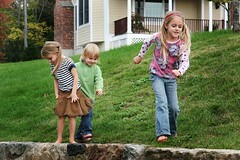 To learn more about Alterra’s commitment to the environment, please visit their website. Alterra has AWESOME coffee…perfectly roasted with a huge selection of organic and fair trade varieties. Be sure to check them out…they ship everywhere. If you’re ever in Milwaukee, you MUST go to their coffee shops…they are so unique, beautiful, and bustling with coffee lovers. I wish we could have spent more time in that area just to hang out and drink coffee. Thanks to Alterra for keeping us awake on the road! When we come into an area, we usually have one family that we “know” there. However, in Ossining, we had THREE (and throughout our time there, we met many more families who we will never forget!). We parked the RV there before we headed off to the city…and then we came back to it on Monday to spend more time hanging out with these amazing families. I “met” Andrea quite awhile ago and have always loved her gentle spirit and her sensitive heart towards the Lord. 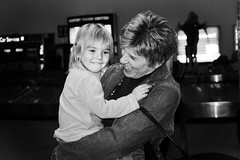 Some of you may know her as “The Flourishing Mother” in the blogosphere. She writes delightful entries about her role as a Christian mother and wife. Spencer and Andrea have 3 girls (14, 7, 5) and a little boy (2)…and we just ADORE this family. Bella got along famously with the kids and is still talking about them to this day. We stayed up late into the night talking with Spencer and Andrea…we ate the most amazing food (tofu tacos…yum yum! )…and experienced blessed fellowship. They fed us not only physically, but spiritually as well. We felt such a connection with them and know that our paths will cross again. We spent a wonderful afternoon with Dorothy and Keith and their girls. Keith is a fellow “greaser”…who bought a Golden Fuel Systems kit and will be installing it in his Suburban soon. Matt and Keith went “grease hunting” and found nearly 200 gallons of grease for the RV and for Keith to store for future use. Dorothy and I enjoyed hot tea and watched the girls play princess and ride the bikes around the neighborhood. I also had the pleasure of meeting “L.L. Barkat” from Seedlings in Stone and Green Inventions Central. Laura is an incredibly intelligent and sweet spirit…and I so enjoyed getting to know her better. It was VERY difficult to pull the RV out of Ossining…it’s always hard to say goodbye, but this was the hardest so far. Andrea wrote in our ‘tour book’ before we left and said, “…God brings His people together at a time of need and definitely NOT by chance.” I couldn’t have said it better myself. We know God had all of these “appointments” already planned and we are so thankful. When I was a little girl, I dreamed of a life in the big city. In this imaginary life, I lived in fabulous row house, ran around in high heels, and worked in a high-powered job. 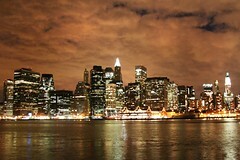 And if I couldn’t have that, then I at least wanted to visit NYC and pretend to be those things! Well….I finally got my chance! Of course, my visions didn’t exactly align…Instead of high-powered in heels, I was a dreadlocked, mama from the Midwest in tennis shoes…slinging a nursing 3 year old around the city that never sleeps. Ahhhhh…how life changes. We weren’t alone in our exploration. My sister, Laura and my brother, Scotty…along with Laura’s roommate, Amy, flew into La Guardia on Friday night LATE and we all stayed in one hotel room in Queens. We took the train into Manhattan on Saturday and Sunday and spent the entire two days taking it all in. New York City. How do you describe it to someone who has never been there? Crowded? Busy? Insane? Dirty? It did live up to all of those descriptions…but it was so much more. It was alive with energy…bustling with talented and creative people who LOVE their city. It IS crowded, but I loved watching every face go by me on the sidewalk. I wondered where they were going and what was going on in their life. There were so many lives intersecting and people interacting everywhere. How can you not LOVE this city? It is also perfectly laid out to live without a car…the subway may be a little dirty, but it’s FABULOUS. I adore the subway. It’s easy, cheap, and fast. There is so much to do. So much to see. So much to take in. I could go into detail and tell you every little thing and how amazing it was…but then I will have no stories for later Plus, there is just no way to put into words all of the sights and sounds and smells. So, I will let you browse the photos to see our adventures in image form (154 photos to be exact…that should be plenty to give you a “picture” of our time there!). Hint…click on “View as Slideshow” to go through them quicker. I have added quite a few captions for this set…so if you want to know more details about our adventures, be sure to click on them individually. It was exhausting and amazing. When we came back to the hotel each night, we exchanged many back and foot rubs But it was so worth all of the walking, leg cramps, and stinky subways…to experience NYC in all it’s glory. What a weekend…I can’t wait to go back! Photo album with captions here.